The one to pick if you want a little magic on your next trip down to Budapest. A location on the old side of the Danube and breathtaking Art Nouveau designs make a stay at the Four Seasons Hotel Gresham Palace feel like a fairytale (squint a bit, believe hard enough and you might even think that’s the case.) Tucked away on the Pest side of the Danube, a stay here makes it easy to understand why Budapest is called the Paris of the East. Medieval castles, wooded hills and traditional towns form the backdrop of the hotel… but, in the end it’s what’s inside that’ll leave you spellbound, whether that’s the Preciosa chandelier hanging from the lobby’s glass ceiling, the upper-floor pool with views over Pest, or the winding staircases which carry on to infinity. The rooms are spacious, contemporary, and blessed with jaw dropping views of the Danube or the city, and The Kollàzs Brasserie and Bar serves the best tasting menu this side of the city. Excellent hotel. Will use again on my next visit to Budapest. Fabulous Hotel in a great location. Exactly what I expect from a Four Seasons Hotel property. What a wonderful hotel - the location is perfect, the staff in general were pleasant, courteous and efficient. The only staff which were slightly lacking were the bar waiting staff who on more than one occasion were in deep conversation with each other and also with other guests leaving us waiting for a bill or for a drink refill. All other staff were superb - from the doorman onwards! The hotel is beautiful, the ambience is warm and welcoming and the amenities fabulous. One of the best experiences I've ever had at a hotel. Beautiful property. I was given an upgrade to a room with a fantastic view. The staff was very helpful in making arrangements for me. Excellent hotel. Felt incredibly luxurious after river cruising for 2 weeks! The style of the hotel was elegant and sympathetic to the history of the building. Very beautiful. Service was very good in Kollacs for breakfast and dinner. My negroni in the bar was superb! Just the best 5 star service we ever had. Extremely service minded. Double upgrade, so we had a wonderful room overlooking the Danube river.Several little attentions. Beautiful art deco building.Central location, so we could do everything by foot.The best hotel in Budapest!. I will come again. Service is perfect. Wonderful. Peace heaven and luxury in the centre of Budapest. It is one of the best and most grand hotels we have ever been to. We celebrated my fiances birthday and they had prepared several surprises, the hotel made the whole weekend fell like a long luxurious celebration! Excellent service and very nice extra features! Bravo! Excellent location, beautiful building, friendly and efficient staff. Limited vegetarian options, although this is true throughout the city. Bartender excellent. I very much enjoyed my stay. Really good hotel with beautiful public areas, very good spa, good room (our room), excellent service and nice bar and breakfast. I would have hoped that the wine list (Tokaji selection) was better, but still the concierge team made very good recommendations for us in the matter. The price of the transfer service seemed to be a bit too steep for the price level in Budapest. I will stay nowhere else in Budapest, and book with no other agent than GLH. it s a friendly highly attractive place in an elegantly restored historical building. Very good experience, really felt looked after. Superb hotel. Ideal location. Very friendly staff. We were delighted. The only downside might be the which might be not as as good as the hotel. Quite simply an outstanding hotel and we would not hesitate to recommend it. 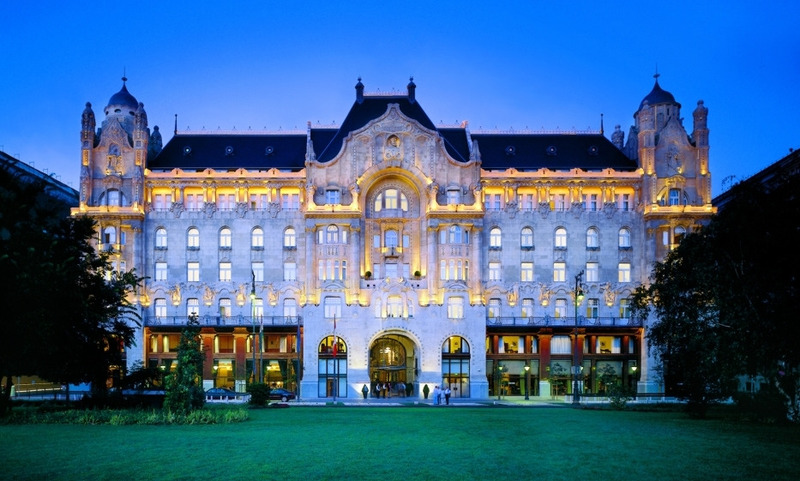 Gresham Palace is an extraordinary building with the best possible view in Budapest. I could not stop taking pictures of the beautiful details of the decoration. I would like to thank you for the special attention we received due to Grand Luxury Hotels notifying the hotel about our wedding anniversary. The bottle of champagne and the cute little biscuits were a great surprise.